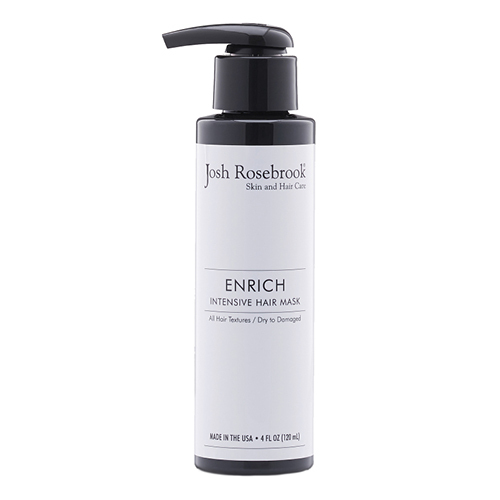 The Enrich Intensive Hair Mask by Josh Rosebrook bathes the hair and scalp in a stunning arrangement of advanced fatty acid-rich plant oils that offer moisturization you see and feel after one use. Apply this organic blend of nature's botanicals anytime hair is not feeling and looking its healthiest. Appropriate for all hair types, Enrich gives a nourished quality to the hair cuticle from your scalp outward holistically, without synthetics, silicones and harmful chemicals. With over 30 organic plants, this powerful formulation lends a fortified feel to hair, returning it to its healthiest appearance. Apply thoroughly to towel dried wet hair and massage in or comb through. Allow Enrich hair mask to penetrate for 5 minutes to an hour, the longer the better. Wrap hair in a towel if desired. Rinse thoroughly. You can apply Enrich as often as desired, 2-3 times a week is recommended.